Jacques Abbatucci, Mario de Beni Arrigoni, Marcos Bassi et al. A global pursuit (with layovers in Japan, Argentina, Brazil, US, France, Britain, and other countries) for the best steak in the world, "Steak (R)evolution" features exclusive conversations with chefs, farmers, butchers, steakhouse owners, journalists and experts about the many variables that affect the quality of our meat. Director Franck Ribière explains a variety of farming methods and offers a clear description of how the humane treatment of animals (and the different preparation methods) positively impacts our meals. Moreover, "Steak (R)evolution" unravels small-scale operations have impacted - and raised the bar - of the entire industry, and how meat producers have implemented sustainable farming practices across the board. 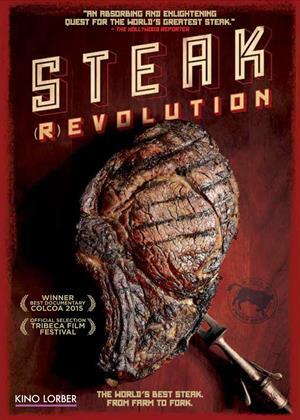 Both informative and utterly tantalizing, "Steak (R)evolution" is a must-see for any steak enthusiast.